Besides its natural beauty, Prescott, Arizona has three exceptional things about it. 1. Prescott sits amid the largest stand of ponderosa pines in the world. 2. Prescott was Arizona's first territorial capital. 3. Since 1888, Prescott has been home of the world's oldest, continuously running rodeo. This rodeo is still held around the 4th of July. Address: The Prescott Chamber of Commerce, 117 W. Goodwin Street, Prescott, Arizona 86302; 928-445-2000; 800-266-7534. Email: chamber@prescott.org. Web: http://www.prescott.org or http://www.visit-prescott.com. Bandera, Texas bills itself as the Cowboy Capital of the World. Contact: Bandera Visitors Bureau, 1206 Hackberry, P O Box 171, Bandera TX 78003; 830-796-3045; 800-364-3833. Email: bandera@hctc.net. Web: http://www.banderacowboycapital.com. In this case, it's Hot Times, Very Hot Places! Known as the poor man's Dante's Inferno because of an underground fire that has been burning for more than 40 years, the coal mining town of Centralia, Pennsylvania has been the setting for the film Silent Hill, starring Radha Mitchell, as well as bestselling novelist Lisa Scottoline's new book Dirty Blonde. 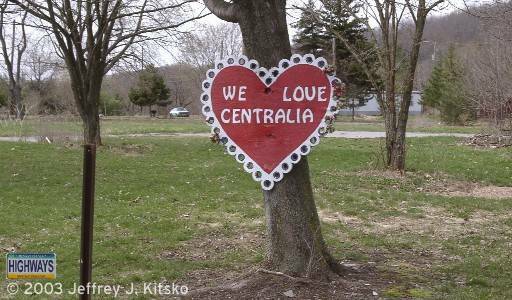 The story of Centralia's fire began sometime in 1962 along the outskirts of town when trash was burned in the pit of an abandoned strip mine, which connected to a coal vein running near the surface. The burning trash set fire to the exposed vein of coal. Thought to be extinguished, the first began burning underground. For two decades, the government battled the fire in a number of ways: flushing water down the mine, excavating burning material, cutting ditches, etc., but all attempts to put the fire out were fruitless. By the early 1980s, when much of the town was abandoned, the fire had encompassed 200 acres. The fire continues to this day and is expected to continue for many years to come. Note: It is very dangerous to walk or drive in the area near the fire. As the Pennsylvania Department of Environmental protection notes: "Walking and/or driving in the immediate area could result in serious injury or death. There are dangerous gases present, and the ground is prone to sudden and unexpected collapse. DEP strongly discourages anyone from visiting the immediate area." The best resource for more information about the on-going fire is the offroaders.com web site at http://www.offroaders.com/album/centralia/centralia.htm.